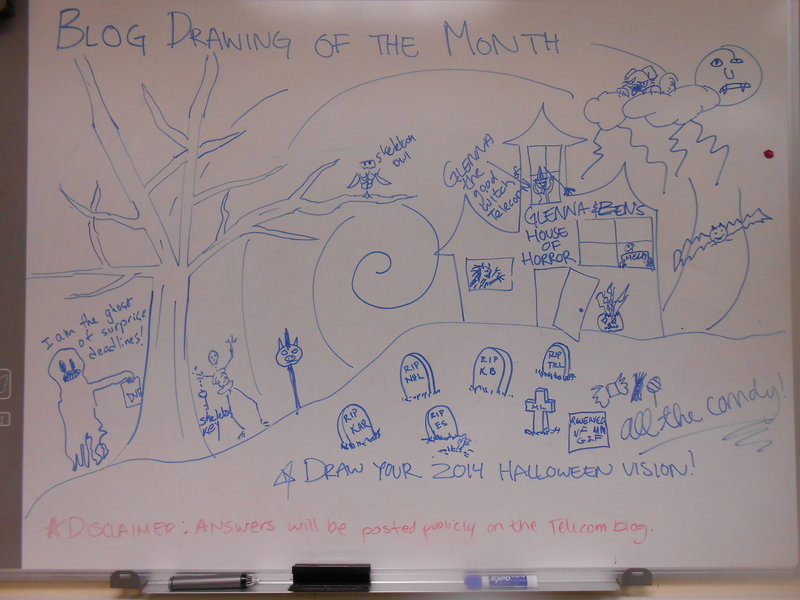 Drawing of the Month: Updated Halloween! There are just three short little spooky weeks standing between us and the famous Telecom Halloween Party! Now that we have an official host (you rock Glenna! ), it is time to start adding some detail to the Halloween mural. This week, Glenna the Good Witch of Telecom was added as well as the head of last year’s roasted pig! There is also some sort of strange vampire dog hanging out in the clouds, which is very creative! Also thanks to whoever reserved a spot on the mural for a GIF. Let’s add some more detail to the mural people, like maybe some creepy things in the tree or a hint as to what your Halloween costume this year is going to be. You may notice a theme of sorts in this week’s blog. 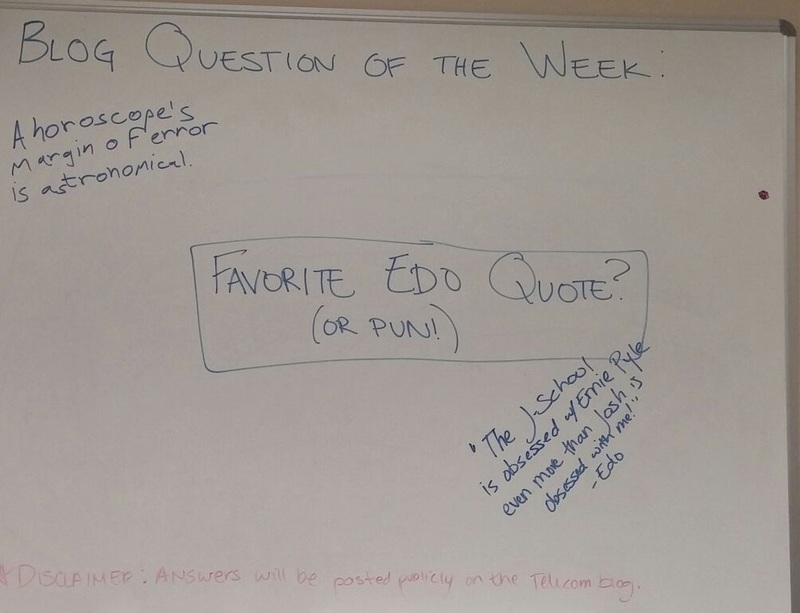 It is rather “Edo-centric.” From an article about the Edo-lead improv team to the sine qua nonsense post and even this week’s question, it is all Edo, all the time. 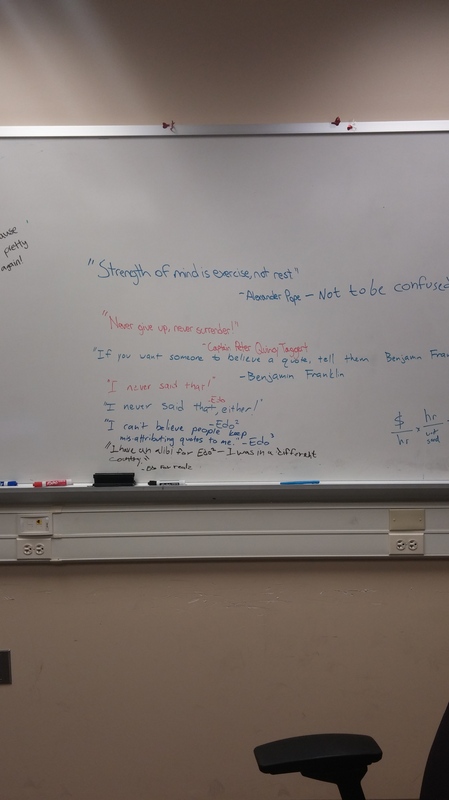 The blog question of the week was actually inspired by the writing that mysteriously filled the whiteboard in the lab over the summer (See below). Buck up Edo! We all know that no one is as punny as you! 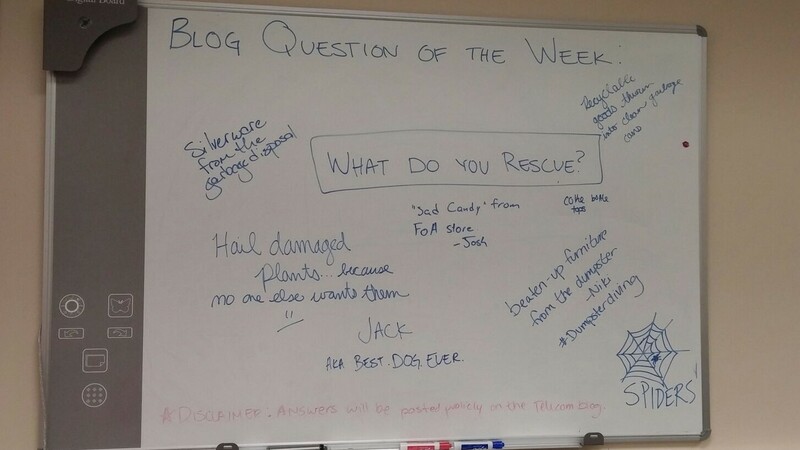 Question of the Week: What do you Rescue? This week’s question had a few people confused about what “rescued” really meant. For now we’ll avoid any heady discussion about who rescues whom and the philosophical ramifications of word choice, and just say that our department rescues some weird stuff! Mona has previously admitted to saving ailing plants from Home Depot, while Niki enjoys a good dumpster dive for some old furniture. Ashley recently rescued the world’s best dog, Jack, and YanYan rescued her kitty, Pumpkin. Also making the ranks of weird things to save include the “sad” candy at the store and spiders! Clearly we’ve got some sympathetic hearts in our ranks! 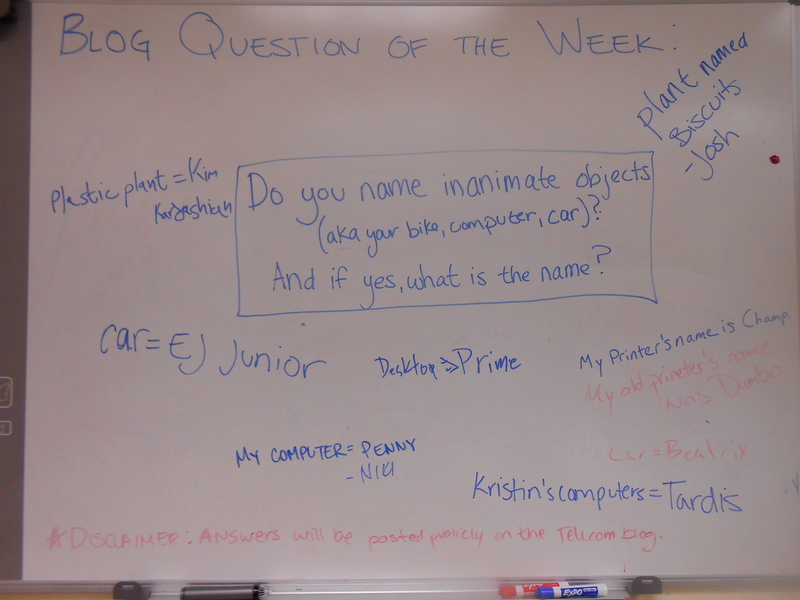 Question of the Week: Do You Name Inanimate Objects? It happens to all of us. We get a little too close to our car, computer or house plant and suddenly inanimate objects in our lives have names (and often personalities to go along with those names.) From Kristin’s nerd-themed computer names (including Tardis, K9 and Sonic) to Josh’s lonely bachelor days talking to his hibiscus plant “Biscuit,” it seems like most of us in the Department have some household objects that are near and dear to our heart. Check out the board below for a few other named inanimate objects. Now the real question is does Rob have a name yet for the eye-tracker in ICR?